Ready to take the next step in your online presence? Don’t Wait! Today’s the day you take your business to the next level! Our entry level web site package will let you hit the ground running with wordpress and the latest technology to ensure your website will be ready for all devices! 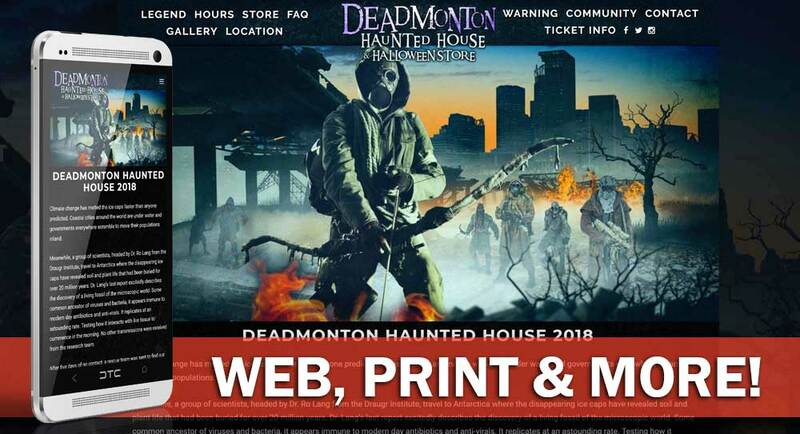 The Soul Sucking Demon Package is a complete Haunt marketing solution. 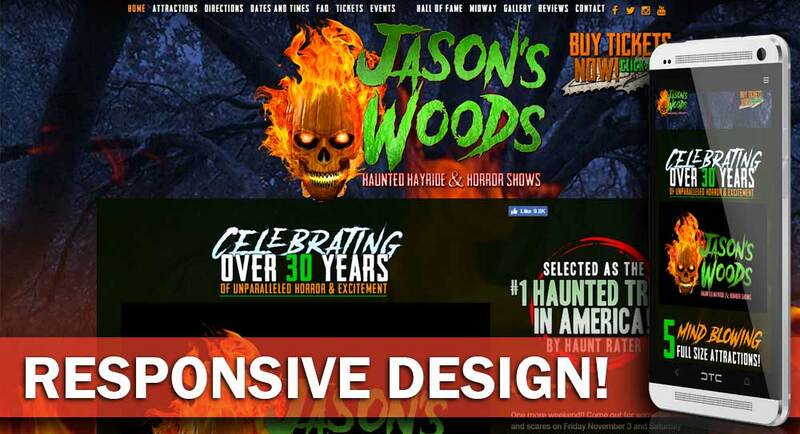 It includes artwork, print design and a full Responsive WordPress site with Search Engine Optimization! Video clips created for site based on trailer or other provided or stock video. Mobile devices are fast becoming the way most people view your site so why does the mobile experience have to be so boring? With The Ripper we’ve created an unholy marriage between our popular immersive media sites and the convenience of wordpress. Stop compromising! Start blowing your guests away with the best of both worlds! Contact us for more details! A shopping cart system is the most important aspect of any business that wants to sell their product online. Its also one of the most vulnerable to hackers. 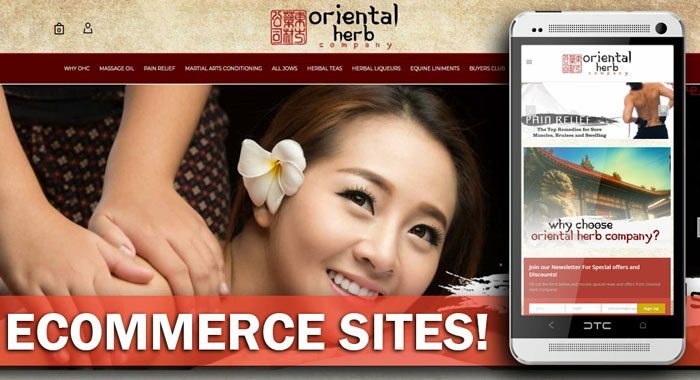 We want to make e-commerce sites that will work and be dependable. That’s why Rogues Hollow E-commerce packages come with a special hosting service that will keep your shopping cart’s system updated with security fixes and patches as they become available. If something should happen and your website is hacked, we’ll fix it and get you back up and running. 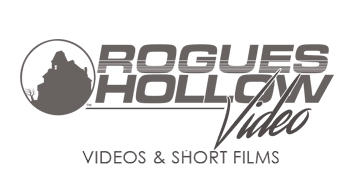 You may find companies that will sell you cheaper commerce packages and hosting but they probably won’t be there to keep your site updated and protected the way Rogues Hollow will. Packages begin at: $1200 – Please contact us for a detailed quote! Integration with Escape Room ticket services such as bookify, bookeo and others. Escape Rooms have become the fastest growing entertainment industry of the last decade! Having a great escape room is important but not investing in a attractive working site to sell tickets is a huge mistake! 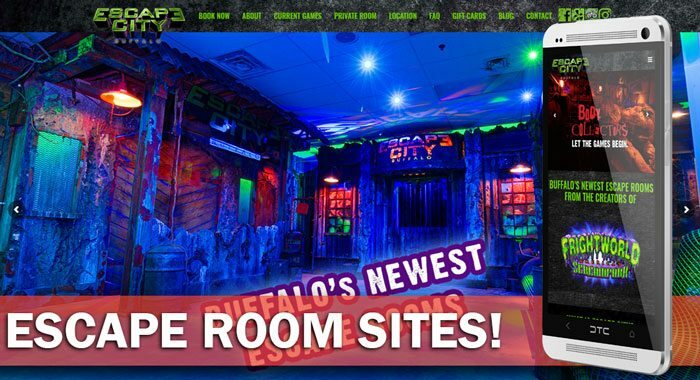 Rogues Hollow has been designing Escape Room sites for years and we know what makes them work! Visit our Video Services Page for Full Details and Examples! 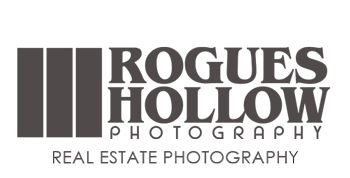 Rogues hollow can come out to your location to take photos of you event or business. Whether its here in Ohio or all the way in California we can come to you and shoot your haunt and actors. Photography costs are $900 (plus travel expense) for a minimum of 10 finished photos for promotion of your event. Depending on the haunt we can provide a ridiculous number of photos. If you have great make up and sets then its more likely we’ll have a lot more photos when all is said and done. For example when we went to the Los Angeles Haunted Hayride we ended up providing over 50 photos! HDR Photography is also available! So let us shoot your haunt! CLICK HERE TO MORE DETAILS AND EXAMPLES! Below are some more of our popular services. If you’re interested in combining any of the below items to a package above, contact us for special discounts! Billboard Design – Yes we do billboards! Contact us for a quote! Don’t see what you need? We also can do billboards, posters, coupons, email marketing, viral marketing, short films, E-Commerce websites, worpdress websites and more! Contact us or call 614.408.3137 to get a custom quote! *Service and support includes phone support and basic text or content updates. † Additional fees will apply for motion graphics or extensive special effects.